Introducing a whole new way to scan. With on-board CPU image processing, the new Panasonic KV-S5046H scanner radically outpaces the competition. Instead of a slow software interface, the scanner's on-board processor does the heavy lifting. Hardware image processing on the KV-S5046H allows you to scan a document and sample different scan settings without rescanning the original over and over. Until you output your document as a file, the original document data is temporarily stored in memory. This allows you to manipulate a scan without the time and frustration of rescanning. Conventional scanners put all of the processing tasks onto PC-based software. The KV-S5046H scanner has its own, built-in CPU that handles most image capture and processing steps from sharpening and contrast to trapping errors. The KV-S5046H performs a single, high resolution scan then temporarily savesthe raw image data in memory that stays intact until the desired image quality is achieved and the document is output as a file. 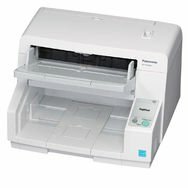 The KV-S5046H instantly provides nine different scanning options so you can choose what your final output will look like before you output to file. The KV-S5046H continuously analyzes output quality, flags poor scans and blank pages, then generates a warning icon for each questionable page scanned.